We’re all familiar with the adage you can’t manage what you can’t measure. Although most people would agree with this statement, many companies jump through hoops putting measuring into practice. A vast majority of companies are not able to accomplish this even if they wanted to. If this is you, you are not alone. Measuring and monitoring for many commercial real estate organizations that manage real estate are complicated. An Altus report stated that nearly 78% of organizations worldwide use multiple software systems that don’t communicate with each other. This structure makes understanding global cash flow, asset performance, and overall expenses very hard. In a perfect world, a commercial real estate company would be able to immediatelysee their entire company overall financial cash flow, net operating income, or any other financial metric. Unfortunately, the current systems and tools commercial real estate companies use were not designed for asset management analytics making this analysis difficult or nearly impossible to achieve. The hard truth is that most companies already have a crazy amount of data available within their real estate company. But since most companies have systems that don’t talk to one another, it is hard to put this data to good use and see a global picture view. Data has a story to tell, and once it is aggregated and displayed in an interactive and graphical way, we start to really understand the story that is being told. Getting to the data with the current technology is not impossible, but a significant manual effort is required to aggregate the information before any analysis is ever completed. Because of this inefficiency, most companies find scaling is difficult and their lack of visibility results in unaddressed costs overruns. Then, add lenders and investors frequently requesting updates and information to the mix, and reporting becomes a time-consuming necessary activity. Every delay in communication to these key players erodes confidence. All of this negatively impacts the bottom line. STRATAFOLIO came to life because we struggled with the same problems most commercial real estate companies currently struggle with. We spoke with over commercial real estate owners all over the country. They wanted a solution. They wanted control. They wanted something better than their current systems. We created STRATAFOLIO to solve this problem for commercial real estate companies. 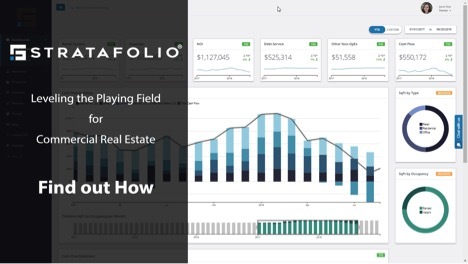 STRATAFOLIO is an online software solution that aggregates critical information from your organization’s accounting and property management systems into a single interactive dashboard. With STRATAFOLIO, our customers can look at their entire portfolio, or isolate to a single legal entity, or asset type. Or, even look at their data at different periods of time in just a split second. Our loan dashboard provides our customers with the ability to see all their existing loans, the total market value associated with their assets, and other key metrics. These metrics help a company quickly understand their debt profile in just seconds. Finally, there are system alerts designed to help you stay on top issues, cost overruns, expiring leases, and loan renewals. We give you the tools to work proactively instead of reactively. We make the hidden nuggets of gold buried in your financial and operational metrics visible, so you can make smarter moves. Harness the power of your data with STRATAFOLIO. All Beta participants will receive a 30% discount once we go live in early 2019. Reach us at support@stratafolio.com to secure your place. Previous Previous post: Retail…For Whom the Bell Tolls?